Interested in learning how I took these shots? Check out my Free Star Photography Tutorial & Star Photography Workshops at the top of this page. From one of my most memorable nights under the stars. Paul Weeks and I decided to head up to Crater Lake last March for a few nights of snow shoeing and exploring around the rim. After a really nice twilight and sunrise we decided to hike up to the Watchman Tower which provides the highest overlook in the park during the winter season. After a long day of hiking and shooting we were much to tired to set up any tents so sleeping bags & mats on the snow was about the beset we could do. 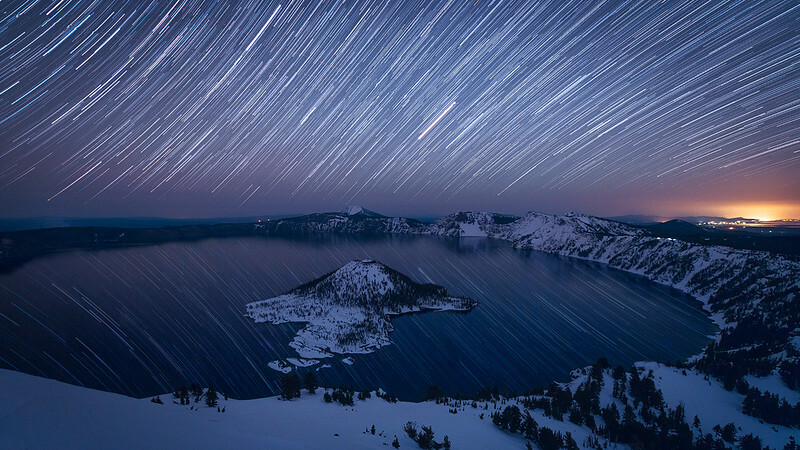 With no wind the temps dropped to 25 degree F which really isn't bad for winter night at Crater Lake. As we laid out in our bags I set up a star trail composition and let it fire off for a few hours. You can learn how I created this exact shot using my Free Star Trails Shooting & Post Processing Video Tutorials linked below.